JBB EXCLUSIVE: Interview With Joe Long–Part One! For Jersey Boys and Four Seasons’ fans, last month’s Jersey Boys Fans Unite to Support BC/EFA event was an evening like no other. The entire Jersey Boys cast, JB writers Marshall Brickman and Rick Elice, and the legendary Four Seasons (Tommy DeVito, Bob Gaudio, Joe Long, and Frankie Valli) all in one room shaking hands, signing autographs, and chatting the night away with fans. A truly unforgettable experience! Even though it was a pipe dream back in ’75, never, ever did I think I’d have the opportunity to interview the incredibly talented Joe Long, but 32 years later–it did happen! I am honored to present Part One of a three-part interview with the legendary Joe Long. In Part One, Joe talks about his early years and how he became a member of the chart-topping Four Seasons. JBB: You’re a Jersey Boy. Tell us about your early years. How did it all begin for you? Was it always your dream to be in a band, or did life take you in that direction? What led you to playing bass? JL: Both of my parents were Italian. At six years old, I started playing the accordion, or as my dad called it, â€˜the corâ€™deen.â€™ I was born in the late Depression, and my dad always told me that if you learn to play an instrument, you can always get a job. My interest in music continued until I was about 14, then I became much more interested in baseball and girls. Then, when I was a late teen, my dad got very, very sick, so I had to go to work to support my dad, my mom, and my kid brother. Back when I was working full-time, I had a nasty accident and my left hand became pretty useless. After about 2 Â½ years of rehab, I rekindled my interest in music and became a self-taught bass player. Although Iâ€™m not really left-handed, I played left handed because of the injury. I began training and studying with Alfonse Strazza, who was the principal bassist for the New York Philharmonic. I originally wanted to pursue a career in the concert field. I also began playing a lot of jazz. Because my hand lacked the strength to play classical music, I switched to the Fender bass-guitar and began playing rock. I also took some conducting, harmony, and theory courses at a conservatory. JBB: You became a member of The Four Seasons back in 1965. What were you doing before that? JL: Before becoming a member of The Four Seasons, I had a number of my own bands and we toured around the country. JBB: How did you become a member of the 4 Seasons? Tell us about the audition process. JL: My agent at the time, whose name was Frankie Fame, arranged for me to meet Tommy DeVito right after Nick left the band with no warning. We met at a music store in Belleville, New Jersey. There was no left-handed bass at the store, so I played a conventional bass upside down for Tommy. Two days later, I met with Frankie, Bob, and Tommyâ€”and they told me I was probably going to be the guy for the job. JBB: Just like thatâ€”you were offered the job? JL: Well, about two weeks after the initial meeting Tommy called me at my momâ€™s house. They offered me the job right on the phone and they wanted me to join the band immediatelyâ€”take a plane and join them at an appearance within a few days. JBB: And, you said, ‘Iâ€™ll be there’? JL: Well, I told Tommy I couldnâ€™t leave my current band without giving them a two-week notice. Tommy wasnâ€™t too happy with my response, but I explained that it wouldnâ€™t be fair to my other band to leave them without some notice. Tommy called two days later after talking to Frankie and Bob. They agreed that I could join the 4 Seasons after I gave a two-week notice to my other band. This was right after Nick left the group. They felt that I wouldnâ€™t leave them high and dry, without proper notice. JBB: Prior to that initial meeting at the Belleville music store, did you already know Tommy, Frankie, or Bob? JL: No, I didnâ€™t. Nick was the only one of the Four Seasons that I knew before joining the band. Back in Asbury Park, I was playing at bars with other bands and so was Nickâ€”this is before they hit it big in â€™62 with â€œSherry.â€ Nick worked with a band at Mrs. Jâ€™s, which eventually became the famous Stone Pony, and then I worked with my band at the Zulu Club, right along the beach. Nick and I would spend our days on the beach, gathering a bunch of guys and girls, teaching them harmony parts, and singing. Thank you to Joe Long for taking time for this wonderful interview. In Part Two, Joe will reflect on his incredible career with the Four Seasons–the hits, the concerts, the recordings (including an amazing audio surprise from the late ’60s), and some other fascinating insights. That gave me goosebumps. I love this interview. It sounds like Joe was a great addition to the band. I can’t wait for part 2. Thanks! Fantastic interview! Very well written. I too am looking forward to Part 2 & 3. Great job!! Joe is a legenday member of a legendary group. Joe should be in the R and R Hall of Fame (emphasis added!). Scott, I think everyone agrees with you re the Hall of Fame. In fact, David Cace has been saying that since the first day I met him a year or so ago. Go figure. It’s not the same as the Hall, of course, but Joe, along with the original Four Seasons, is finally getting some of the recognition he so rightly deserves! And it’s so nice to see him post periodically on Frank Rovello’s fine GILG site. Joe Long and Paul McCartney are the most talented/gifted bass player/musicians in R&R history. Joe is a most talented musician. Induct him to the HALL! Not only is Joe a talented musician, but a fine man as well…He i truly a rare and loyal friend!! I’ve been a fan of The Four Seasons since I was a teen in the 1970′s. Today the license plate on my car proudly displays Joe’s first song with the group. Any Four Seasons fan should know what it is. I love the song. Joe should be in the hall of fame. 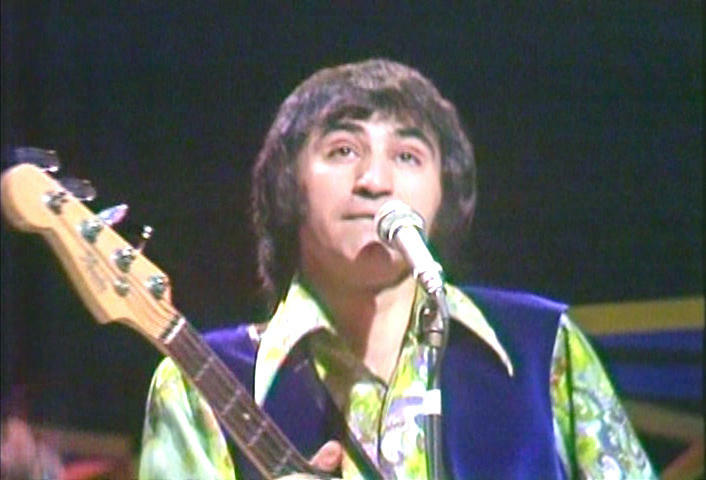 Other than Frankie himself, Joe recorded songs with the group well into the 1970′s. I was thrilled to see Joe made an appearance with the group last month. A Four Seasons fan should consider Joe to be as much a member of the Four Seasons as Frankie, Bob, Tommy and Nick. Maybe some day in my lifetime I can get to meet Joe too, but don’t know if he’ll be around in another 32 years. Joe is one of a kind! Joe Long is the BEST bassist! Very good interview. Of all my knowledge of The Four Seasons back when I was growing up with them,Joe Long was the Season I knew least about. This interview is especially interesting and I look forward to reading more about Joe Long. To have been given the opportunity to perform with The Four Seasons only says one thing Joe Long is also a very good and a talented individual and has what it takes to be a FOUR SEASON! I’m going to make an educated guess and say “Let’s Hang On” was Joe Long’s first hit with the group. I’ve taken the group history, chart history, and listening to the 25th Anniversary in chronological order to determine this. After this point, many of their records have the strong bass line. Let us know if this is right, Tom. I too Ted have always been curious about the late 65 early 66 recording time frame. While I have never had the opportunity to speak with Charlie Callello, I have been very fortunate to have had the opportunity to speak with Nick Massi about the last song he recorded and with Joe Long about the first song he recorded. Nick Massi told me that the last song he recorded with the 4 Seasons was “Let’s Hang On!” There is also empirical evidence to back this up. The recording date for “Let’s Hang On!” was August of 1965. Nick left the group in September 1965. This also means that Nick’s last recorded album was the “Big Hits” album which recording date as I recall was also August 1965. Also on the “What’s New Pussycat” album cut from “Big Hits” you can hear a Nick Massi solo bass part which I believe to have been his last, and the last solo bass part ever to appear on a 4 Seasons’ record. Joe Long has told me that his first recording was “Opus 17 (Don’t You Worry ‘Bout Me).” The recording dates also back this up. Remember it use to take a month or two to go from recording to release (at least in the “old” days). Joe told me that the last song he did was “Who Loves You.” I remember seeing Joe perform “Who Loves You” with the group in concert and I recall seeing TV shows with Joe perform it as well (Mike Douglas and a “Midnight Special” as I recall). So Joe bridges the gap from the original Seasons of Frankie, Bob, and Tommy to the new Seasons most notably of Polci and Ciccone and everyone in between like Demetri Callas. The great bass work you hear on “Who Loves You” by the way belongs to that of the talented Joe Long. Quite an impressive resume for Mr. Long. And this man is not standing alongside Frankie, Bob, Tommy, and Nick in the R & R Hall of Fame? I can only infer from all of this that Charlie Callello sang on the “Working My Way Back To You” single and the album cuts that appear on the “WMYBTY” album. Perhaps Charles Alexander and Frank Rovello can confirm this or provide additional information. Thanks David for your usual great information. I do notice now that you mention it the transformation from almost A Capella in “Spanish Lace” and “Connie O”, (yes there’s the guitar and piano, but not central to the songs) to the great Charlie Calello band percussion sections (I find myself doing “air” chimes! ), to the “metal” in later works. I don’t remember seeing Joe Long credited on the “Who Loves You” album, but I’ll dig it up and look again. I had heard he was on “Who Loves You” and that that recording had been produced quite a while before release in late 1975. Speaking of delays between production and release, that probably cost “Dawn (Go Away)” the #1 Hot 100 Chart Position IMHO. It was reportedly recorded November 20, 1963, just two days before the Kennedy Assassination. Whether the label searching or that period of confusion following that Friday contributed to a delay has been speculated upon, but I think a slightly earlier release would have had “Dawn” topping the charts. As I recall, our local Top 40 station, WTRX, was playing “Dawn (Go Away)” right after Christmas, late December back in ’63, though! Joe Long (LaBracio) was my best man at our wedding and the morals and ethics he displayed in his first contact with the 4 Seasons were those I had always observed in Joe. His abilities as a bass player and vocal harmony played a big part in the continued success of the 4 Seasons during his time with the group and I truly believe he warrants being considered for the Rock & Roll Hall of Fame. From everything I’ve read, Nick Massi’s last song with the Seasons before leaving was “Let’s Hang On.” Ironic, since he didn’t. Charlie Calello appears on “Working My Way Back To You”. Joe Long appears on everything from “Opus 17″ to “Who Loves You”. Nick Massi did appear vocally on a 1973 (maybe it was 1974?) single: “Hickory”/”Charisma” and he did a brief bass solo on the latter cut. He also worked with the other guys on the vocal arrangements, and you can hear his technique. Anyway, Joe Long is a wonderful human being and it is great to see him getting this spotlight. He was a “true” Season. I have a copy of the Motown single “Hickory/Charisma” and a DJ copy which has only “Hickory”. I’ll have to listen to see if I can hear Nick’s basso profundo on it. “Hickory” was played on many Adult Contemporary stations in my area, though it didn’t chart AC. I agree that Joe Long belongs in the Rock and Roll Hall of Fame. If it isn’t under consideration, maybe it needs to be brought up again. Joe Long, (aka Joe LaBracio) definitely belongs in the Rock & Roll Hall of Fame. His contributions to the success of the Four Seasons in the late sixties and 70′s is immeasurable and should not go unrecognized! Joe is a talented musician and exceptional human being. TELL IT TO THE RAIN AND BEGGIN AND THAT REMINDS ME, WERE GREAT LONG HITS ALSO, A TRUE GENTLEMAN! In reply to Ted, it would be extremely tough (if not impossible) to fit “Let’s Hang On” on a license plate. Most states limit the characters to 6 or 7. With that in mind, I requested a license number with my favorite Four Seasons “number song”–Joe’s first. It’s “Opus 17″. The characters “DEC 1963″ would make an excellent license number for Four Seasons fans even though Joe didn’t participate on the song. Tom, I’ve seen vanity plates that had abbreviations like “LTSHNGON”, so I wasn’t sure. “Opus 17″ occurred to me, and it’s also interesting that a third Linzer/Randell composition, “A Lover’s Concerto”, was prominently featured in “Mr. Holland’s OPUS”. BTW, who played bass on “Let’s Hang On”? Joe Long was actually with the Four Seasons longer than Nick Massi – he belongs in the Rock N Roll Hall of Fame!!! Joe is a talented bassist. He comes from my hometown of Elizabeth, NJ. The Four Seasons were my favorite band back in the day. Joe was a big part of their unique sound and should be in the R & R Hall of Fame. As a side note, my band “Donna Marie and the Mistics” opened for the Four Seasons in 1968 at the Asbury Park Convention Center. I alao play bass. It was an experinece I will always remember. Thank you for this interview, it was very interesting to read about Joe Longâ€˜s background. I had the privilege of seeing Joe Long with the other Four Seasons, Frankie Valli, Tommy DeVito and Bob Gaudio in Asbury Park back in the 1960s. They put on the best live show Iâ€™ve ever seen! The 4 Seasons where on fire that night. It was a very powerful show and Joe had a Rat Pack type of monolog joking going on all night with Frankie Valli and the other guys. Not only was the music perfect but these guys were all very funny. They are truly one of the best rock and roll groups of the 60s. I just saw the Jersey Boys play with my wife in NYC a few months ago and enjoyed hearing the music again, it was a great story. I usually hate when my wife drags me to a Broadway musical, but this time Iâ€™m so glad we went. However the Four Seasons live shows are still the best. Joe and the 4 Seasons will always be my favorite American band. I have never met Joe Long, but he sounds like a wonderful man. I really appreciate their music. Yes Freddie I would agree that the 4 Seasons with Joe Long put on the best live show of any artist I’ve ever seen perform, and the Asbury Park Convention Center shows were the best of their best. Pictures of the 4 Seasons 1968 performance at the Convention Center in Asbury Park can be viewed here on the JerseyBoysBlog in an October 18, 2007 posting.